Avianca’s LifeMiles are an unusual currency. They can often be purchased cheaply and used for flights on Star Alliance carriers. But they come with at least one noteable restriction: all your flights must be in the same cabin. If a particular cabin is not offered on a give route, that doesn’t matter, you can’t downgrade, you’re just out of luck. In my case that’s a big impediment because United, the only Star Alliance carrier in my city, only flies 1-cabin regional jets to my airport. Therefore, if I wanted to use LifeMiles for an international trip in a premium cabin, I’d have to position myself to another airport first. Also, I’ve read that if you’re trying to book something more than a simple trip and have to call in that the call center is (not surprisingly) mostly Spanish speakers and it can be hard to find someone to help. 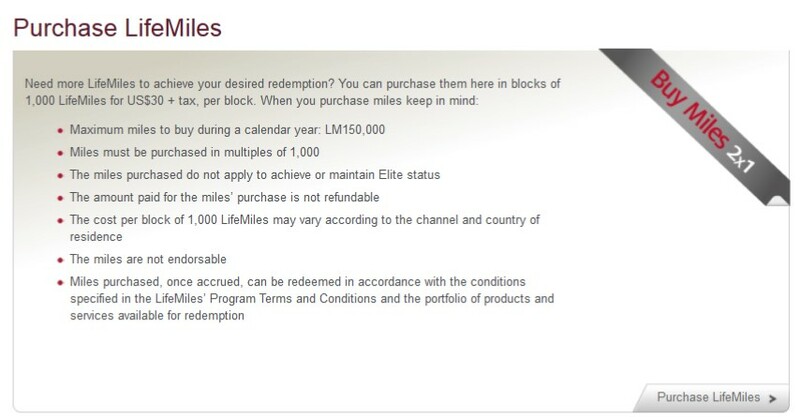 For these reasons I’ve never gotten into LifeMiles. Right now Avianca is offering LifeMiles at 2-for-1 pricing. Miles are available in blocks of 1000 miles for $30 USD + taxes. A maximum of 150,000 LifeMiles may be purchased during a calendar year. This sale is good until September 30, 2014. Beginning October 1st, the cost of purchased LifeMiles will increase. At the same time Avianca announced this price increase, they also announced an award chart devaluation effective for flights on October 15th and beyond. That means it’ll take more LifeMiles on that date than it will today. Life Miles is the frequent flyer program of Colombia-based Avianca Airlines which is part of the Star Alliance. While the routes it flies are not currently on my radar, I always keep an eye on their frequent flyer program. They frequently offer sale prices on buying their miles and these miles can be used on virtually any Star Alliance carrier for travel anywhere within the network. Not only that, but often they require fewer Life Miles for a particular routing than other programs require for the same flights. 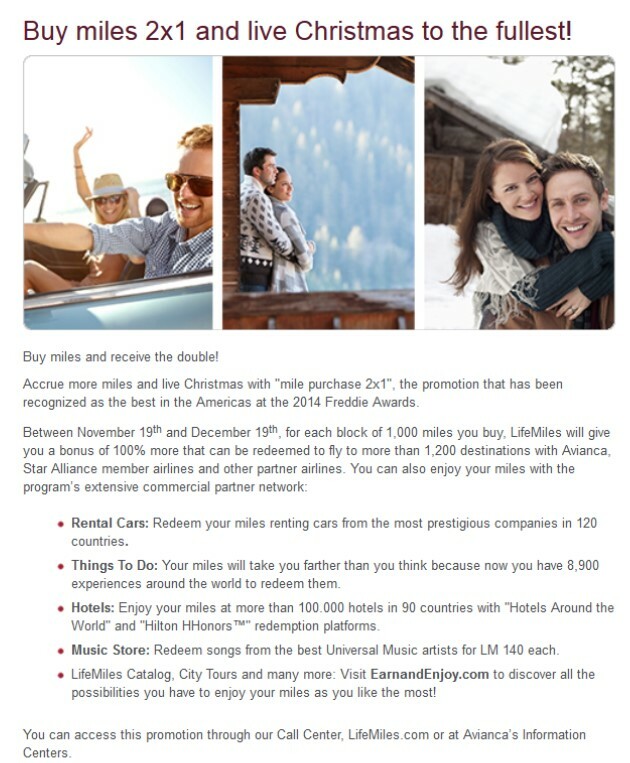 To take advantage of these sales, your Life Miles account usually needs to have been open for a specified number of days. So go ahead and open one now and if/when the need arises for buying miles, you’ll be set. A word of warning though: their call centers are located in Central America and from what I understand it’s often very difficult to find someone to speak English. So if you don’t have a Spanish-speaker on hand, it might help to find one before making your calls to them! Also, when traveling on a Life Miles ticket, all flights must be in the same cabin and it doesn’t matter if a certain cabin is not offered on a specified flight. In my case, our only Star Alliance carrier is United and since UA only offers 1-cabin regional jet service out of my airport all my flights using Life Miles must be in economy. That’s OK if I’m planning a domestic trip but if I wanted to fly overseas it means I must make a positioning flight via some other method (other miles or cash) if I want to use Life Miles for a business or first class ticket. As for changes in air ticket redemption with Star Alliance member airlines, these include increases up to 13.000 miles in Economy Class and up to 26.000 miles in Business Class. Both cases apply for round-trip flights from North America. For round-trip flights from Mexico, there will be reductions up to 15.000 miles and increases up to 14.000 miles in Economy Class, also reductions up to 20.000 miles and increases up to 28.000 miles in Business class. So the changed number of miles depends on your origin and destination. You can find the current mileage amounts on their mileage calculator, which can be found HERE and then click on the link for Star Alliance. This is a great example of unexpected program changes and the reason why the common wisdom is not to buy miles speculatively.